Looking for a Used XJ-Series in your area? CarGurus has 1,948 nationwide XJ-Series listings starting at $3,900. A rare sight on the road and a beauty to behold, the Jaguar XJ is the full-size luxury sedan for those who enjoy every act of driving. It’s entirely understandable if, off the top of your head, you can name only two luxury car brands. Mercedes and BMW are the most recognizable, because they’re all most Americans buy when $700 monthly payments and $3,000 property taxes are of absolutely no concern. Then there’s Jaguar. In 2014, Mercedes and BMW each sold more than 330,000 cars. Jaguar barely registered 16,000. So the flagship XJ—a beautiful, rich, stunning machine that actually costs a good deal less than the S-class or the 7 Series—is a rare sight on the road. We’re not sure why, but we’re here to inform you that it exists and very much deserves your attention if you’re sailing such high seas. Just look at it. After five model years (a mild refresh is coming for 2016), the XJ is gorgeous. It has not aged, tired the eye, or done anything for wear. Jaguar spends so much effort on basic proportions—short overhangs, slim glass, a windswept, half-moon curve defining an elongated body—that the XJ is always graceful, with just enough muscular definition around the fenders and hood to suggest it can throw a punch. Inside, the color and texture arrangements are pretty much what you’ll find in a Bentley. It’s tailored. An XJ feels special because you’re never next to one, and while it offers everything you can find elsewhere, it’s all delivered with a tangible warmth that the stern German cars can’t manage. Major choices are simple: regular or long wheelbase, rear- or all-wheel drive, and 6 or 8 cylinders. Either wheelbase carries four trim levels (Base, AWD, Supercharged, R) and up to a dozen three-color interior combinations. Our test car was an XJ AWD finished in Dark Sapphire (a deep sparking blue) with Truffle and Cashew Truffle leather (two delicious contrasting browns). Also on hand were the Portfolio Package ($4,000: heated and cooled 14-way front seats with passenger memory, power lumbar, massage, leather dash, contrast stitching and piping, microsuede headliner, four-zone climate control) and a heated windshield ($375), a rare feature on any car. Total with destination rang to an even $83,000. 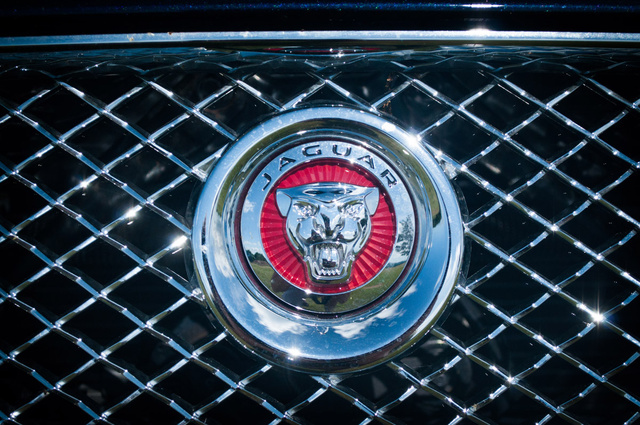 Other world markets start with 4-cylinder turbo and diesel engines, but in the U.S., we get Jaguar’s best. A 3.0-liter supercharged V6 with 340 hp and 332 lb-ft of torque comes standard on all Base and AWD models. 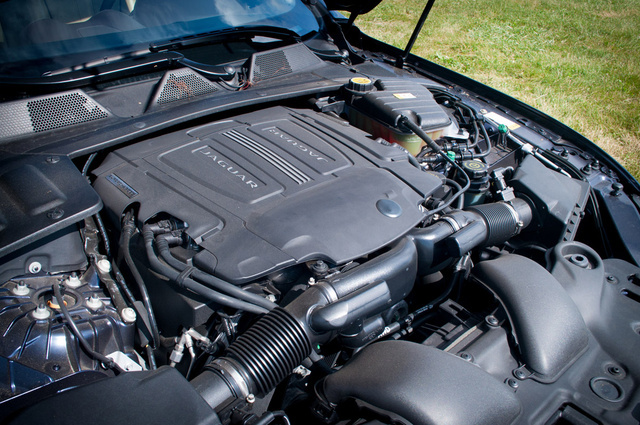 Supercharged models turn up with a 5.0-liter V8, supercharged of course, delivering 470 hp and 424 lb-ft of torque. For those with friends in law enforcement, the XJR dials out monstrous numbers: 550 hp, 502 lb-ft of torque, and a 174-mph top speed. We’ve tried all these engines and found the six most pleasing and potent enough in everyday use, even with four adults onboard. The XJ’s all-aluminum body is several hundred pounds lighter than most large sedans, at 4,123 pounds in our AWD model (and a lithe 3,854 in RWD models). Together with the 8-speed automatic’s well-spaced gear ratios, our car had no trouble gunning away from stoplights and cruising calmly on the highway. We also averaged close to 24 mpg, another laudable number in this segment. Of course, if the V8’s shove steals your heart and bellowing exhaust clouds your better judgement, you’ll be envied by all. No one, aside from true sports cars, will be able to keep up. Aside from Jaguar’s poor start/stop system, which vibrates the cabin and always seems ill-timed in its feeble attempts to save fuel, the XJ drives several sizes smaller. The hydraulic power steering is quick, light, and full of feel, and the adaptive suspension, which alters the dampers automatically and can be tuned to a firmer setting, is on the harsher side. Personally, we like how it sharpens the XJ’s response (on the standard 19-inch tires), although drivers seeking a coddling ride should look elsewhere. This is a car for drivers, and everything—from the “dynamic mode” programming to the firm brakes and low mass—is more involving than a BMW, which has abandoned this classic sport-sedan formula. A car this sleek can’t raise the roof too high, which limits headroom, particularly for rear passengers. Overall space is a little cozier than in other big-wig sedans, but not cramped. Long-wheelbase models offer a bounty of rear legroom and can pamper backseat riders with reclining and massaging seats, along with remotes to take control of the entertainment system. The circular air vents swivel, and a simple twist of the center knob adjusts the flow. The paddle shifters are plastic and don’t feel up to par with the rest of the car’s sublime materials. The rotary gear selector, which rises out of the center console at ignition, is one of those unnecessary mechanisms likely to break. It also prevents a quick getaway when you really need it. Same for the electric glove box lock, which requires a finger swipe over a small metal circle. The map lights also are touch sensitive. The ice blue mood lighting, including within the air vents, is swank, and the burled walnut wrapping around the doors and dash in one continuous arc is an artisan effort. This is a fine place to be. The Meridian stereos in these cars are top notch, with Surround Sound processing that’ll make your downloaded MP3s stream like studio masters. Ours had the basic 14-speaker, 380-watt system, but you can upgrade that to a 20-speaker 825-watt unit or splurge for the 26-speaker, 1,300-watt “reference” with three speakers mounted behind each front seat. 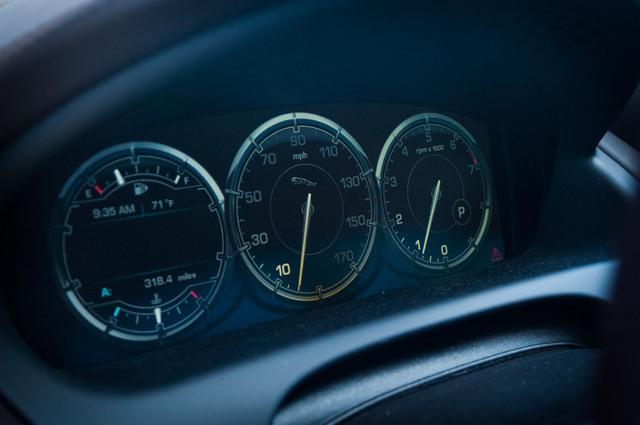 We’re not huge fans of the TFT digital instrument panel, which lacks the depth and appeal of a real gauge cluster and doesn’t offer much customization. 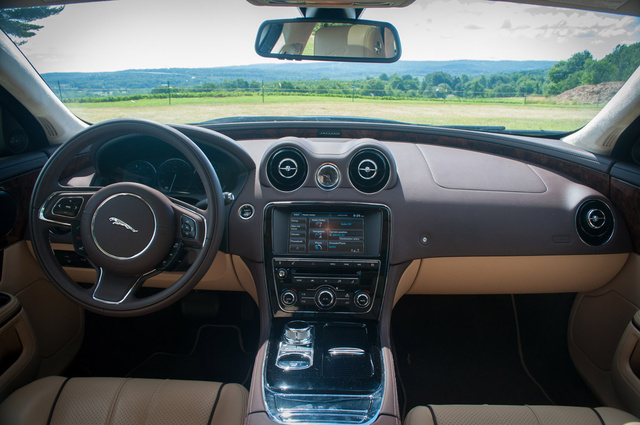 The 8-inch touchscreen interface is easy to use but still laggy at times, something Jaguar and Land Rover have not managed to shake off. That means the seat controls for massage, heat, and cooling take a while to respond, as does seeking radio stations. Those functions should always have physical buttons. The navigation map doesn’t overlay live traffic and lacks detail, plus it’s not a very good navigator. Directions to turn sometimes appear too late, so you miss them. 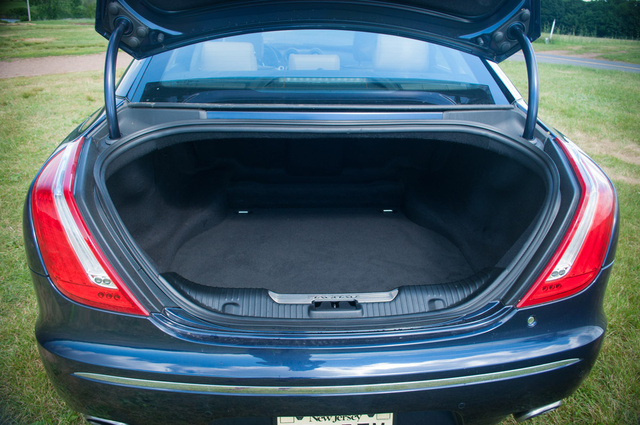 The doors have a soft-close feature with electric motors that silently nudge them into the latches, plus the trunk closes by itself. You’ll find way more gadgetry in a Mercedes. When you drive the XJ as a car instead of a computer, you don’t really care. The XJ has not been rated by the National Highway Traffic Safety Administration or the Insurance Institute for Highway Safety. That shouldn’t worry anyone, as this is a solid chunk of car. The adaptive cruise control can prime the brakes if it senses a potential collision, although the XJ does not automatically brake or issue alerts. Lane departure, night vision, pedestrian detection and other driving assists are not available like they are on other luxury sedans. Only blind-spot detection shows up on the XJ’s roster. Parking sensors and a backup camera are standard. All the usual airbags, whiplash-reducing headrests, and stability control are here. The XJ lineup shines on price. You can’t go home with a new S-Class for less than 100 grand. And while the XJ is an older model without the modern electronics of the German competition, its essence as a luxury touring car with razor-sharp performance makes it every bit as competitive on the traits that really count, including how incredible you’ll look getting in and out. Maxed out, an XJR long-wheelbase will run just shy of $135,000. That’s the 550-hp limo that can outgun basically everything its driver sees. You’ll need another 10 grand minimum for an S63 AMG. But that’s on the high end. A well-equipped XJ like ours ($83,000) has everything we’d want. Jaguar has seen climbing reliability scores, too, but we’d ask other XJ owners how they’re faring before keeping the car past warranty. But since most flagship buyers trade regularly, this isn’t a major concern. Look good, feel good. That’s what the XJ is about. 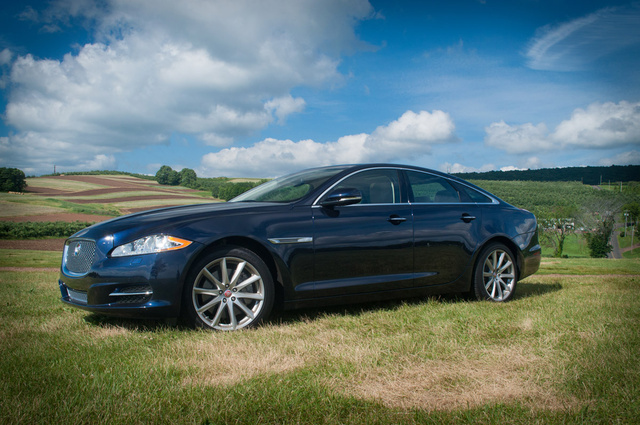 What's your take on the 2015 Jaguar XJ-Series? Gmc3024 JUST BOUGHT A 2015 TRADED MY LS 460 DIDNT THINK I WAS GOING TO LIKE IT AS MUCH CAUSE I'VE BEEN WITH LEXUS FOR 6 YEARS BUT I LOVE THE WAY THE XJ DRIVES ITS A SMOOTH BUT YET SPORTY RIDE. 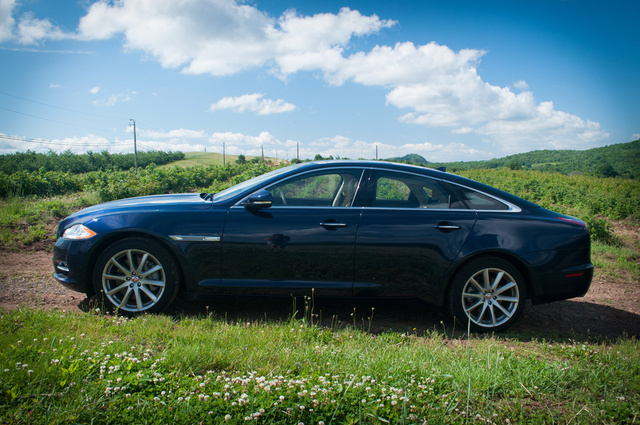 Have you driven a 2015 Jaguar XJ-Series?